It took two trips to the range to mentally adapt to using the same swing on every club but once it clicked I was in heaven. Shot my best round of 72 three days later. The quality is excellent - solid clubs with no frills. 10 yard gap between every iron and I actually picked up about two yards per club. I heartily recommend these to any golfer and two of my buddies have already ordered sets. Don't second guess the fitting formula. Go strictly by your wrist-to-floor measurement and the clubs will fit you perfectly. It's actually the only fitting that has ever worked for me. I tried the Sterling irons with poor results. Beautiful irons with obvious quality throughout. I swore by my Mizunos for the past ten years but I will state emphatically that my 1 Irons are superior in design and performance. My distances are approximately the same as my Mizunos but more consistent from club to club (11 yard gap between irons). I am sold on the single-length concept and expect my handicap to drop. As has been stated in almost every posting, the customer service is excellent. Like many, I had numerous questions which were expertly answered through emails and phone calls. I tried the Sterling irons From Wishon Golf and was very disappointed at the performance. Unfortunately, they do not offer a return policy, all sales being final, so I was stuck and my money gone. After selling the Sterling irons on ebay for half of what I paid I purchased a set of the Pro-line irons from 1 Iron Golf (they do offer a 30-day return policy if not completely satisfied). I will not be sending these clubs back - in fact, the Russian army could not get them away from me! They are the finest set of irons I have ever owned. Distance, accuracy, consistent ball striking, it's all there. I would recommend these irons to anybody no matter your handicap. Fantastic! I called them three times with many questions and was given expert answers - no sales hype whatsoever. Very solid feel through impact and the ball shoots off the clubface like a rocket. I hit them great right out of the box although they suggest a few trips to the range to get acclimated to single-length play. I have picked up a couple of yards in distance with every iron even though my 1-Irons are a #9 iron club length. This is probably due to the fact that for the first time I have clubs that really fit me. I would recommend these clubs to any one. Best irons I've ever played. Took me two trips to the range to get the feel for them and once it started to click I was in heaven. The best customer service I've ever experienced. Spoke on the phone with the President of the company twice and he gladly answered all of my questions. He is a wealth of knowledge. I've been playing the 1 Irons for three years and my scoring has dropped from shooting in the 90s to shooting in the low to mid 70s. By far the best set of irons I have ever owned. Like everybody else states, the customer service is fantastic. I've never experienced this level of service with any company. These irons have really opened my eyes about golf equipment. I initially tried them as a lark not really expecting too much, but after two weeks of playing them I will never go back to standard golf clubs again. I'm a very good golfer (shooting in the mid-70s) and I've never played irons that have improved my ball striking consistency like my 1 Irons. For those who think you lose distance with the shorter #3 through #5 you are wrong. In fact, I have picked up about 3 yards per iron over my old set. The amazing part is that I nail 9 out of 10 shots with the #3 iron and drop it on a dime which I could never conceive of doing with a standard #3 iron. I would recommend these irons to anyone regardless of handicap. Extremely high rating in this category. What you read throughout the internet concerning the high level of customer service is absolutely true. 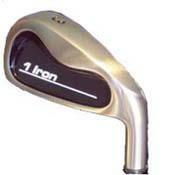 I loved these irons straight out of the box. My first thought was that they just felt right for me. Right length, weight, and feel. The fitting formula they have is spot on! My first trip to the range I hit shots like I never did before. The crispness of the hits was something I'd never experienced with any other irons. Long and straight. Since I got the clubs my scores have been going down one or two strokes with every round of golf. I started with a 29 handicap and now I'm down to a 21. Extremely well built golf clubs. Solid feel through impact and deadly accurate. Distances are a little more than my old set of irons even though my 1-Irons are built to a regular #8 iron club length. Like everybody else says, the customer service is excellent. Answered all of my emails promptly with expert knowledge.